The client is holding a series of parties celebrating the music most associated with the ten decades of the 20th Century. 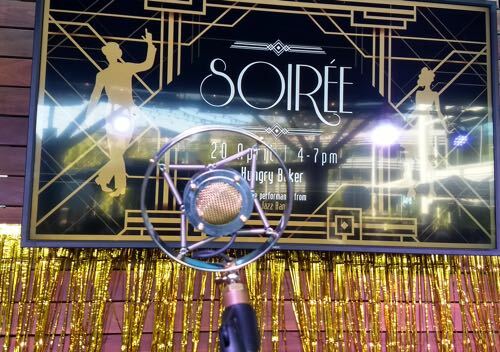 Who to book for their 1920s soiree to ensure it's a success? Greg Poppleton brought along his quartet of world-toured jazz musicians. 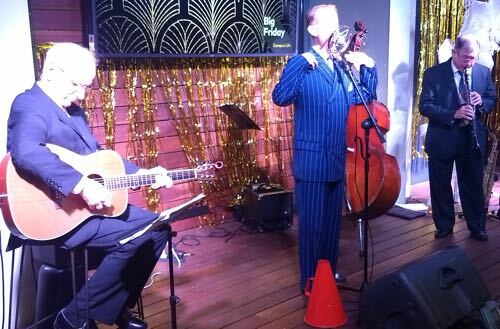 Their authentic, swinging style certainly impressed - and won over a lot of people who had never heard 1920s jazz before. The smiles, the spontaneous little dances here and there, all those who stopped to intently listen, and the nice people who came up to compliment the band after each set, told me that the band was fulfilling its brief. To provide atmosphere as friends and colleagues met in the courtyard to socialise, network and do business. So the music was low, yet energetic. People could talk easily and come and go as they please. The owner of the bar and restaurant next to the courtyard thanking us as both he and we packed up said it all. The band was largely acoustic with two 100W speakers for the vocals and banjo, mixed wirelessly via ipad. Guitar and double bass used a small amp each and the clarinet and alto sax did not need to be mic'd at all to be heard clearly. Enquire about having Greg Poppleton for your event and celebration. Greg Poppleton jazz deco band. Grahame Conlon guitar and banjo / Greg Poppleton 1920s-30s singer / Dave Clayton double bass obscured / Paul Furniss clarinet and alto sax.